Germanicus was advanced quickly as was usual, with the young men of the imperial family destined for important careers. He embarked on the cursus honorum, the series of magistracies that culminated in the consulship by being allowed to stand for the quaestorship in AD 7 at the age of 20, five years before the prescribed minimum. He skipped the next stage, the praetorship, and proceeded directly to the consulship in 12. In the intervening years, he held subordinate commands on the Danube frontier under his uncle Tiberius (AD 7-9), and was rewarded with the ornmenta triumphalia (AD 9), the trappings of the triumph without the parade, and with the perquisites of a praetor when he was in the senate. That same year Tiberius was transferred to the Rhine frontier in response to the disaster that befell P. Quinctilius Varus when he and three legions were trapped, massacred and their standards captured at the Battle of the Teutoburg Forest. Germanicus joined Tiberius in Germany in 11. He spent the year 12 in Rome as consul. [] His position as second in line for the principate had strengthened. Although Augustus was still alive, he was feeble, and Tiberius, positioned to succeed him, was in his fifties, a more advanced age in ancient Rome than it is today. One contender from Germanicus' own generation, Agrippa Postumus, evidently impatient of his subordinate position, had fallen from favor and was dispatched to increasingly remote places of exile after AD 6. 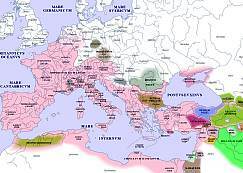 [] The other, Drusus the Younger was advancing in parallel but a few years behind. The next two emperors, Caligula (37-41) and Claudius (41-54), Germanicus' son and brother respectively, used him as a surrogate with the legions where personal loyalty to a commander was paramount, evoking his name relentlessly in order to trade on his still glowing reputation. They had become emperor only because they belonged to the imperial family; Augustus and Tiberius, on the other hand, had military accomplishments that earned them the title imperator legitimately. Germanicus was the 'dynastic lynch-pin' between the Julian and Claudian branches of the family, [] and Claudius especially needed him for a closer connection with Augustus. And even thirty years after his death, Nero's direct descent (his mother Agrippina the Younger was Germanicus' daughter) was still an asset. What would a principate of Germanicus have been like? There is no way to know, although there was not much promise in his ineffectual responses during the mutiny on the Rhine or his strangely conceived trip to Egypt. Some, perhaps most, of the adulation accorded him when he was alive was reaction to the unresponsive Tiberius. Much more came from the fact that he had the good fortune to die young and permit legend to take over. If he had succeeded Tiberius, he would have been the first of the Julio-Claudian princes reared to the purple to put on the mantle of the principate. As it turned out, the opportunity was given Caligula. AJP Special Issue. (1999). 120. Barnes, T. D. (1998). "Tacitus and the Senatus Consultum de Cn. Pisone Patre", Phoenix 52: 125-48. Eck, W., and A. Caballos, F. Fernández (1996). Das senatus consultum de Cn. Pisone Patre. Munich. González, J. (1984). "Tabula Siarensis, Fortunales Siarenses et Municipia Civium Romanorum", ZPE 55: 55-100. Gordon, R., and J. Reynolds, M. Beard, C. Roueché, C. (1997). "Roman Inscriptions", JRS 87: 206-40. Griffin, M. (1997). "The Senate's Story", JRS 87: 249-263. Koestermann, E. (1957). "Die Mission des Germanicus im Orient", Historia 6: 331-75. _________ (1958). "Die Feldzüge des Germanicus 14-16 n. Chr. ", Historia 7: 429-79. Levick, B. (1966). "Drusus Caesar and the Adoptions of A.D 4", Latomus 25: 227-44. ________ (1976). Tiberius the Politician. London. Liechtenhan, E. (1947). "Das Ziel des Aufstandes der Rheinarmee", MH 4: 52-67. Lindsay, H. (1995). "A Fertile Marriage: Agrippina and the Chronology of her Children by Germanicus", Latomus 54: 3-17. Mommsen, T. (1878). "Die Familie des Germanicus", Hermes 13: 245-65. Oliver, J. H., and R. E. A. Palmer (1954). "Text of the Tabula Hebana", AJPh 75 : 225-49. Pelling, C. (1993). "Tacitus and Germanicus": 59-85, in Tacitus and the Tacitean Tradition, T. J. Luce and A. J. Woodman, eds. Princeton. Questa, C. (1957). "Il Viaggio di Germanico in Oriente e Tacito", Maia 9: 291-321. Ross, D. O., Jr. (1973). "The Tacitean Germanicus", YClS 23: 209-27. Rutland, L. W. (1987). "The Tacitean Germanicus: Suggestions for a Re-evaluation", RhM 130: 153-64. Shotter, D. C. A., (1968). "Tacitus, Germanicus and Tiberius" Historia 17: 194-214. Simpson, C. J. (1977). "The Date of Dedication of the Temple of Mars Ultor", JRS 67: 91-4. Simpson, C. J. (1981). "The Early Name of the Emperor Claudius", AAntHung 29: 363-8. Sumner, G .V. (1967). "Germanicus and Drusus", Latomus 26: 421-33. Syme, R. (1958). Tacitus. Oxford. Timpe, D. (1968). Der Triumph des Germanicus: Untersuchungen zu den Feldzügen der Jahre 14-16 n. Chr. in Germanien, Bonn. Walser, G. (1951). Rom, das Reich und die fremden Völker in der Geschichtsschreibung der frühen Kaiserzeit: Studien zur Glaubwürdigkeit des Tacitus. Baden-Baden. Weingärtner, D. G. (1969). Die Ägyptenreise des Germanicus. Bonn. [] The sources for the life and career of Germanicus are primarily Tacitus, Annals 1-3: Suetonius, Life of Gaius Caligula 1-6; Cassius Dio, Roman History 56-57. Bronze tablets that record decrees the followed his death are the Tabula Hebana (Oliver and Palmer (1954), the Tabula Siarensis (González (1984) and the Senatus Consultum de Cn. Pisone Patre (Eck, Caballos and Fernández (1996). [] His date of birth is calculated from the time of his advancement (Sumner  421-3). For his birth name, Simpson (1981) 368. For the cognomen Germanicus in the family, Suet, Cl. 1.3; Dio 55.2.3. [] Tiberius Claudius Nero (the future emperor) became Tiberius Julius Caesar. Agrippa Postumus became Agrippa Julius Caear. Tiberius' son became Drusus Julius Caesar. [] The adoptions: Tac. Ann. 1.3; Suet. Aug. 64.1, 65.1; Tib. 15.2, Calig. 1.1; Dio 54.18.1; 55.13.1a-2; Vell. Pat. 2.96.1, 104.1; Levick (1966). The deaths of Gaius and Lucius: Tac. Ann. 1.3; Suet. Aug. 65.1; Tib. 15.2; Dio 55.10.9-10; Vell. Pat. 2.102.3. [] The children: Suet. Calig. 7; Mommsen (1878); Lindsay (1995). [] Germanicus' early career: Suet. Calig, 1.1; 8.3; Dio 55.26.1, 31-33.3; 56.11-17, 23.3, 25.2-3; 56.26.1. Sumner (1967) 422-3. [] Agrippa Postumus was killed shortly after Augustus died: Tac. Ann. 1.6; Suet. Tib. 22; Dio 57.3.5-6. For more detail about his fall and Augustus' difficulties in establishing a succession, see Garrett Fagan, Augustus, De Imperatoribus Romanis (1999). [] The mutiny on the Rhine: Tac. Ann. 1.3, 31-51; Suet. Tib. 25.2; Calig. 1.1, 8.3; Dio 57.3.1, 5, 6.1; Vell Pat. 2.123.1, 125.1-4. Liechtenhan (1947); Walser (1951). [] Campaign of AD 15: Tac. Ann. 1.55-71; Dio 57.18.1. Koestermann (1958); Timpe (1958); both also for the next year's campaign. [] Campaign of AD 16: Tac. Ann. 2.5-26. A fragment of an epic by Albinovanus Pedo evidently describes the ordeal on the North Sea. [] The triumph: Tac. Ann. 1.55; 2.5, 26, 41; Suet. Calig. 1.1; Vell. Pat. 2.129.2. [] Interpretations of the relationship between Germanicus and Tiberius: Shotter (1968); Ross (1973); Rutland (1987); Pelling (1993). [] Command in the East: Tac. Ann. 2.43, 53-54; Suet. Calig. 1.2, 3.2. Koestermann (1957); Questa (1957). [] Tac. Ann. 2.43, 55-57. [] Tac. Ann. 2.56; Suet. Calig. 1.2. [] It was governed by a prefect of equestrian rank who was responsible directly to the emperor. Egypt was an important supplier of grain. An ambitious usurper might seize it and its resources with relative ease and threaten famine at Rome (Tac. Ann. 2.59). [] Tac. Ann. 2.59-61. Documents and epigraphic evidence corroborate Germanicus' popularity in Egypt (Weingärtner  1-4). [] Tac. Ann. 2.72-3; Suet. Calig. 1.2; Dio 57.18.9; Pliny, NH 11.71. [] Tac. Ann. 2.75, 82-3; 3.1-6. Suet. Calig. 5-6. [] Tac. Ann. 3.10-16; Suet. Calig. 2; Dio 57.18.10. [] AJP Special Issue; Eck, Caballos and Fernández (1996); Griffin (1997); Barnes (1998). [] Tacitean innuendo: Tac. Ann. 3.16. [] Tac. Ann. 4.8; 5.3-5; 6.23; Suet. Tib. 39, 53-54; 62.1; Dio 57.11.1-4; 58.3.8, 8.4, 22.4-5. [] Gordon, Reynolds, Beard and Roueché (1997) 212. Copyright © 1999, Donna Hurley. This file may be copied on the condition that the entire contents, including the header and this copyright notice, remain intact.